The purple boundary in the map below outlines the watershed of your adopted waterway. When it rains, water that falls within this boundary eventually finds its way to your stretch of Mill Creek. Mill Creek's water is directly impacted by all land within the purple drainage boundary. The yellow line represents Turnip Green Creative Reuse's adopted stretch of Mill Creek. Stewardship activities performed on land or water anywhere within these purple watershed boundaries will improve the condition of your waterway. Information on this page was compiled using resources from iCreek. This adopted stretch of Mill Creek is considered unhealthy by the State of Tennessee as a result of four problems — Pathogens, Dissolved Oxygen, Nutrients, and Siltation. Pathogens indicate that water is contaminated by human or animal waste. In urban areas, pathogens end up in creeks when sewer lines leak or when dog owners don’t pick up their pet’s waste. Pathogen problems are most often linked with heavy rainfall, which can overwhelm older sewer systems and/or wash pathogens from neglected pet waste into our waterways. Pet waste that is left in the street, dog park, or even a person's backyard contributes to major water quality problems in Nashville. Low Dissolved Oxygen can be a major issue in a stream environment. In fast-moving streams, rushing water is aerated as it churns over rocks, saturating these environments with oxygen. However, in slow, stagnant waters, oxygen only enters the top layer of water, and deeper water is often low in dissolved oxygen concentration. 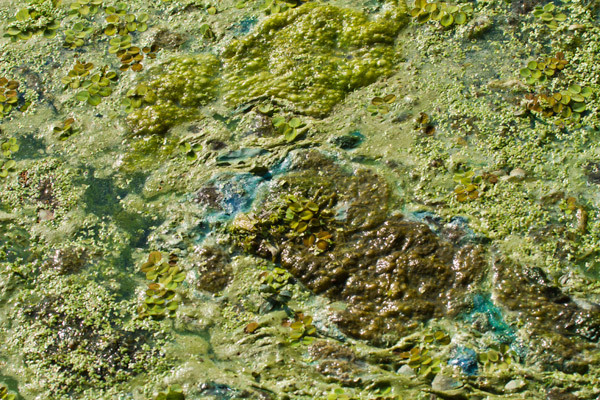 When algal blooms form in waters as a result of nutrients, the highly productive algae use the dissolved oxygen and leave the environment inhabitable for other organisms. Depleted dissolved oxygen in water will restrict or eliminate aquatic life. While some species can tolerate lower levels of oxygen for short periods, prolonged exposure will affect biological diversity and, in extreme cases, cause massive fish kills. Nutrient issues in streams result from over-fertilized urban lawns and gardens. Other sources include pet waste, municipal wastewater systems, and dishwashing detergent. When fertilizers exceed plant needs, are left out in the open, or are applied just before it rains, nutrients can wash into our waterways over land or seep into groundwater. High concentrations of nutrients, found in human and pet waste, can contaminate our waters via leaking sewer lines or neglected pet waste. Increased nutrient concentrations cause nuisance or toxic algae blooms in waterbodies, killing fish and aquatic life. High concentrations of nutrients must also be filtered from our drinking water, since they can cause methemoglobinemia, also known as blue baby syndrome. Silt refers to the dirt, soil, or sediment that is carried and deposited by our water. While some silt in water is normal and healthy, many additional tons of silt find their way to our water every year, negatively impacting water quality. Excessive silt clogs gills, and smothers eggs and nests. It can bury habitat aquatic insects need for survival, which impacts organisms up the food chain that eat these insects for survival. Siltation can also interfere with photosynthesis in aquatic plants resulting in a decrease in needed dissolved oxygen. Siltation also increases levels of treatment needed for drinking water, fills up reservoirs and navigation channels, and increases a waterbodies likelihood of flooding. Plant and animal species within your watershed depend on clean water for survival. The work you do to improve water quality in your watershed benefits not only the people in your watershed, but also the many plant and animals that live there, as well. When iNaturalist users observe plants and animals species in your watershed they will display below. You can create your own iNaturalist account to start recording observed species in your adopted stream's watershed. There are many things you can do to help your creek. We've got some ideas and resources below, but don't be limited to these alone. If you've got ideas for other activities or questions in general, feel free to contact the Cumberland River Compact. Remember to always ensure you have landowner permission before doing stewardship work on public or private land. Feel free to contact the Compact, if you need help obtaining permission. Please give the Compact two weeks notice prior to any planned stewardship activity. 06.12.18 Turnip Green Creative Reuse, Cumberland Kayak, and the Compact with volunteers after a cleanup of Mill Creek. Turnip Green has taken a leading role in removing litter from Mill Creek. Keep up the great work! Consolidated Litter Pickup - City of Nashville can pick up consolidated litter if given two weeks notice. The Compact can serve as a liaison in obtaining this service. Plant (or allow for) natural growth near your waterway. Remove invasive species. Area plant suppliers advertising sale of natives include: Nashville Natives, GroWild, and Gardens of Babylon, Moore & Moore Garden Center, Native Gardens in Greenback. Observe and document species in your watershed using iNaturalist. Your adopted segment has its own iNaturalist page! You can visit it here. This page will show you plant and animal species others are seeing in your watershed. It will also allow you and others in your group to observe and record plant and animal species seen in your watershed. In addition, it can also function like a social media platform, allowing you to interact with others who are making observations and tell them about your adoption or stewardship efforts and opportunities. You can create an account on iNaturalist and email jed.grubbs@cumberlandrivercompact.org if you'd like to be an admin for your page. This will allow you to better tailor your page to your group. Each Spring, the City participates in the Nationwide City Nature Challenge. This event is a fun way to obtain species data in your watershed and engage with the larger region within a regional BioBlitz. Contact the Cumberland River Compact if you're interested in participating in the City Nature Challenge. Distribute stewardship and educational materials in a public place for your waterway. Consider passing out native wildflower seeds, pet waste bags, free soil sampling kits, and educational materials somewhere popular or public in the watershed. Pet waste bags can help keep out pathogens, native wildflowers and other forms of vegetation can filter out excess pathogens and silt, and soil test kits can help landowners not over-fertilize their lawns. Support public funding of water treatment plants and sewer infrastructure, as well as stormwater fees. Report sewer leakages and other water quality concerns. Area watershed associations include the Cumberland River Compact and the Mill Creek Watershed Association. Do your neighbors, family, or roommates know about the challenges your stream is facing? Now that you know how to be an effective steward, enlist the help of others in your neighborhood. Share iCreek or resources within it with your neighbors and encourage them to join the effort to protect your creek. to facilitate this and all other Metro Nashville stream adoptions.The Cumberland River Compact facilitates this stream adoption.